Mirrors are essential everyday home decor devices. In bathroom contexts especially, custom mirrors help exemplify space and maximize natural lighting. However, when looking to enhance your Toronto home, not just any mirror will do. 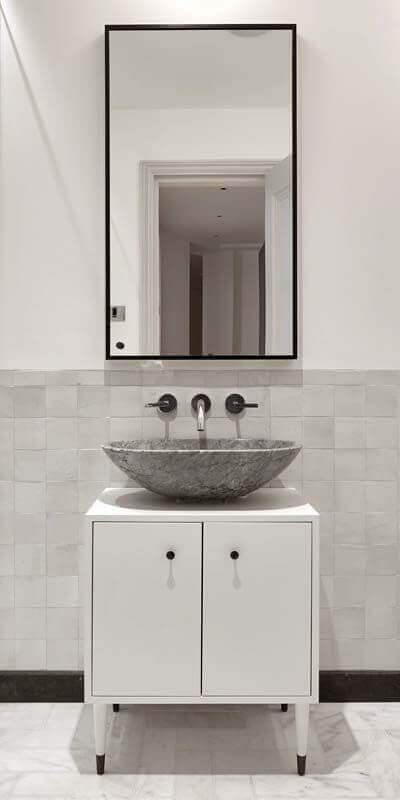 The difference between standard mirrors and custom made vanity mirrors is simple. With a store-bought mirror, Toronto homeowners are limited with regard to where mirrors can be placed for maximum brightness. Conversely, a custom mirror can be designed to fit any surface, ceiling, or wall space. By being designed to fit any surface or frame size, custom mirrors provide several functional benefits. Antique and existing custom mirrors are often considered irreplaceable. However, in the event of an accident, custom mirror experts like ourselves can cut glass to fit any existing frame size. This is particularly beneficial for owners of existing mirrors and family heirlooms which can be damaged during home moves. Historic buildings in Toronto are often subdivided and remodeled into several separate living spaces. When this happens, some properties can be left with unusual wall layouts. Thankfully, a custom mirror can be cut to maximize light and brightness, in properties which feature even the most quirky interior architecture. Everyone uses a mirror to fix their hair in the morning. However, a custom mirror isn’t just ideal for straightening up before work. A well-placed custom mirror can be used to maximize perceptions of interior space and depth. Custom mirrors are, therefore, ideal for placement in narrow corridors, box rooms, and particularly small size bathrooms. At 808 Glass, we’re the go-to company in Toronto for bespoke bathroom and architectural glass solutions. However, we don’t just specialize in the fabrication of frameless glass shower enclosures and architectural elements. Also capable of creating iconic custom mirror designs, we can cut and frame mirror glass for a wide variety of decorative purposes. Whether you are looking to restore an antique piece of furniture or add more light and depth to your home, we can help. We manufacture custom mirrors to fit the precise dimensions of commercial and residential wall space. We also specialize in ceiling mirror installation and luxury glass panel installation, in leading Toronto hotels and business premises. 808 Glass are capable of delivering everything from ultra-modern bathroom vanity mirrors to distinctive standalone mirror designs. At the same time, we can add definitive personal touches to cut glass by incorporating custom engravings and mirror textures. At 808 Glass, mirrors can be created to match any individual design preference. To find out more, call or contact us now for a free, no-obligation consultation.